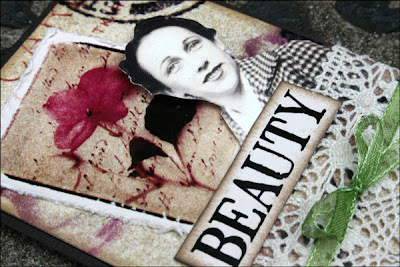 My Creative Existence: Time for an ATC! I used an Art de Fleur Photochip as the background, and inked around the edges using Walnut Stain Distress ink. On top of that is an image from the Art de Fleur Montage sheet, which I cut out and then distressed the edges before attaching it to the ATC. 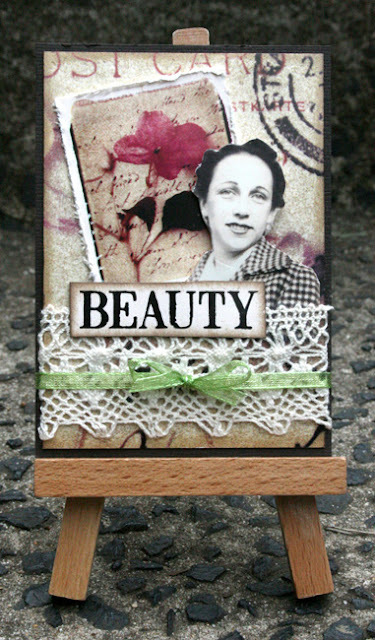 The lady is an image from the Ladies Photobooth sheet that I silhouetted and attached to the ATC before wrapping some lace and ribbon around it, then mounting onto a bazzill cardstock base. The word "Beauty" comes from the Art de Fleur Wordstrip. I cut out the word, and inked around the edges before adhering it to my ATC.